We resist embodiment and we remain outside of our embodied experience. We are disassociated from our bodies, their sensations, aliveness, pain, joy, pleasure. This summer with the explosion of pokemon go we became floating heads attached to screens hunting our next acquisition. Our energy has recoiled into our heads for a completely cerebral experience. The experience is no different as we head back to school and all our heady intellectual pursuits, trying to control our lives from our heads. The two things people request most from me is yoga to help them focus and yoga for anxiety. These two requests suggest to me that we are not in our bodies, we are not connected to our embodied experience. We are scattered, spaced out, in our heads and ungrounded. Being grounded means to fully inhabit your body. It is an openness to your embodied sensations. 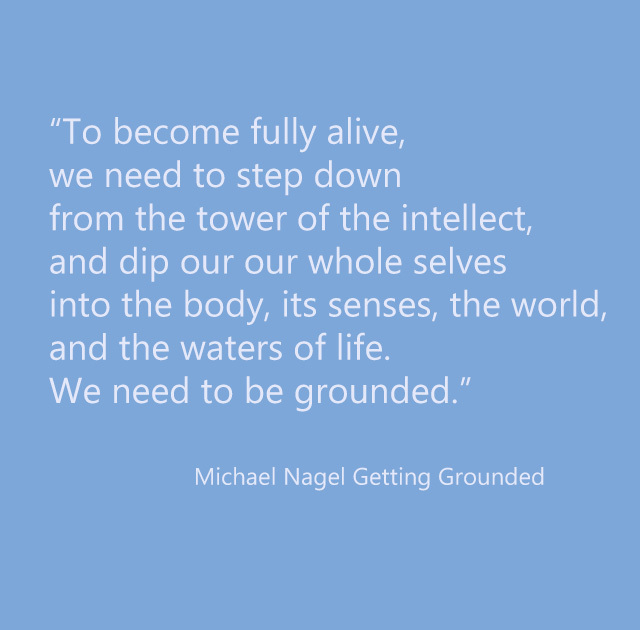 Grounding asks us to step away from our mental distraction to the embodied sensed immediacy of the present moment. 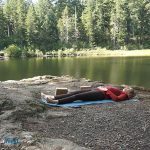 Letting go of chronic tension in our physical bodies and feeling our connection with the earth will help us disconnect with mental diarrhea and drama and connect with embodied sensations. Today we are going to do that through our hands, feet and belly. Our hands are our grip on reality, our feet are our connection to the earth and literally the ground we stand on, and our belly is our center of gravity. Your donations help us to pay for the expenses associated with producing this show from batteries for my mic pack, to medical tape for my headset, to putting gas in our car to drive to the gorgeous locations we find for you as well as expenses such as internet provider fees for uploading large video files and the costs associated with backing up so many video files. We appreciate your support. What movement today helped you feel most connected to the earth? 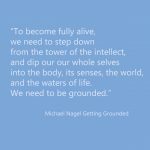 What movement helped you feel most grounded today? If you would like my Back to School List my list of 10 Essential Yoga Classes to get you through the back to school season then scroll to the bottom and put your email address in. Today we focused on grounding. 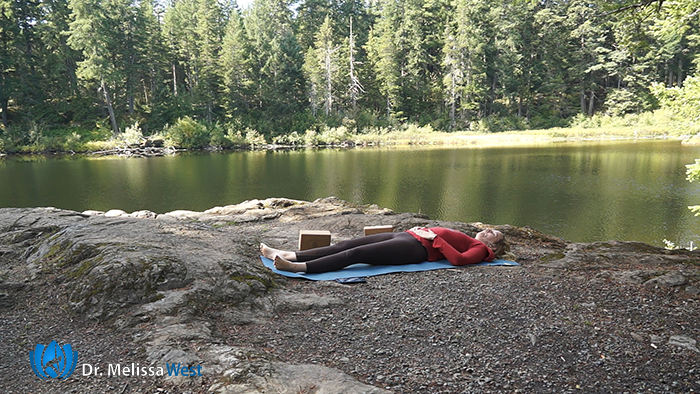 We have two fabulous value added classes on grounding in our membership community. Yoga for Grounding and Yoga for Anxiety.